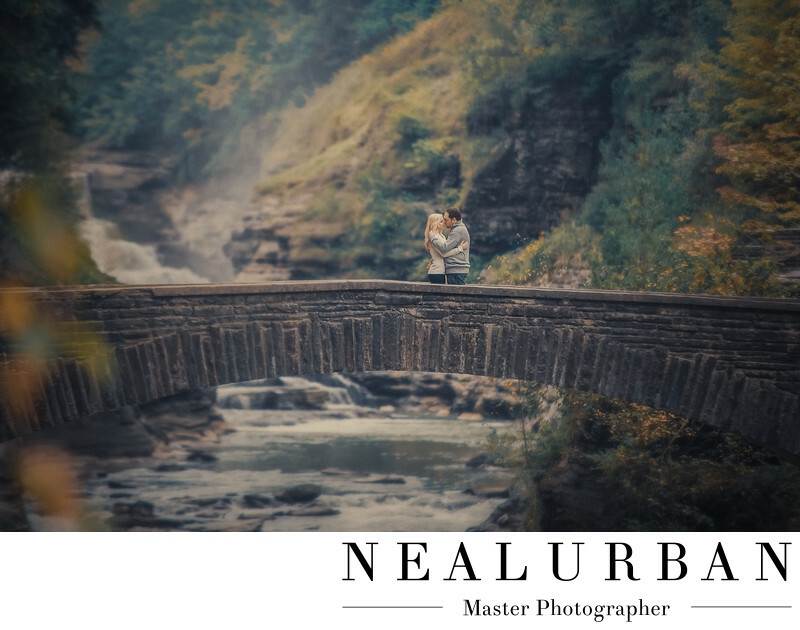 Sara and John had the most beautiful engagement session at Letchworth State Park in Castile, NY. They were planning a November 5th, 2011 wedding in Buffalo at the Marcy Casino. They really wanted to have Fall foliage for their engagement session. We hiked up to Letchworth on a cool and crisp day. It was great weather for their shoot. The Park was a place that meant something to Sarah and John, so they took us to all of their favorite spots. This particular location was a small hike. The stone steps were a little icy. We all took our time getting down to the bridge. It was worth the scary walk! When we got down to the bottom, Neal said to hang back so he could look around for the best vantage points to get the entire bridge with that amazing back ground. Sure enough, we had to go through thick mud, puddles, and more ice to get to where Neal wanted to take the shot. The newly engaged couple got to stay nice and clean and dry on the bridge. As you can see, Neal was pretty far away from Sarah and John. I stood halfway between both so I could relay direction to the couple. They didn't need to much help either. Since it was cold, John pulled his lovely fiance in nice and close to stay warm. This image is gorgeous. Neal captured Sara and John and one of the places they love perfectly. Their outfits were great for the Fall style images they wanted. They paired so good with the colors of the leaves and all of the greenery. The water rushing down into the creek looks like a dream. You can see on the left foreground, Neal shot with a few leaves in front of the lens. It created a nice balance of color to both sides. And helped to frame in the couple. The texture on the bridge also makes this image amazing. It stands out just enough to set the couple apart from the back ground. We love going to locations that are meaningful to the bride and groom to be. We never want to take them somewhere and have them not like their photos because of the location. We always have meetings either in person, through email, or over the phone, to collect as much information about the couple as possible. If they tell us the style they would like, but have no idea where to go, we can give them location ideas. Then they can check them out either in person or online and give us their feedback! We want every couple to look at their images and fall back in love with them every time! Location: 6625 Denton Corners Rd. Castile, NY 14427.